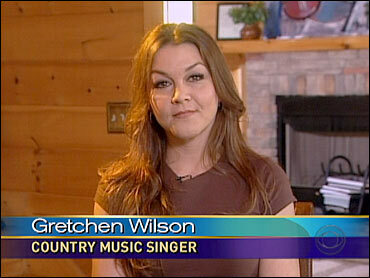 Gretchen Wilson jumped onto the country scene four years ago. Her debut album, "Here for the Party," sold more than four million copies, and her first single, "Redneck Woman," earned her a Grammy in 2005. She's toured around the world, and enjoys all the perks that come with being a country music star. Yet, for all Wilson's success, there's one thing she didn't have. And that's about to change. Wilson, 34, dropped out of school the day she left home -- in ninth grade -- the same day she ran away from home. But she passed her GED high school equivalency exam in April, and will don a cap and gown for a graduation ceremony next week. Wilson says her seven-year-old daughter, Grace, was a big reason she went back to get her degree, because she didn't want to be a "dummy" when Grace asked her a question. Also, "I certainly don't want her to think you can be this successful without an education." And, she says it fills what she's seen as a void in her life ever since she quit school. "This is something that I promised myself a long time ago that I would do," she told co-anchor Julie Chen on The Early Show Tuesday. "And, I'm sure that having a little girl in school is a big part of it, as well -- you know, wanting to be able to be there for her and help her with her homework when the time comes, when she needs my help." Why did she leave home, and school? "You know, like a lot of children, I had a little bit of a troubled home. My parents moved around a lot. They were never really settled in one spot, and just some really kind of bad stuff that went on in the house that really made me want to get out there and just start my life a little sooner than I probably should have and just get out there on my own and start taking things the way I wanted to take them. Quitting school is not something I really wanted to do, but I couldn't hold down a full-time job and pay my own way and go to school at the same time." Wilson put it in perspective, calling it "a big deal to me," and aadding, "I started to try to get involved in taking it right away. You know, as soon as I had the opportunity. But then, life happens, things start happening. Time gets away from you. It's one of those things that I seemed to put on the back burner and didn't really feel was important. But then, I finally -- I got to a place in my life -- I think, when women get into their mid-30s, they start looking inward and starting to just do things for themselves. And this was a piece of me that I needed to finish. So, it's really something that I'm doing for myself but, in turn, hopefully will help a lot of other people to make the decision to go back and get their education, as well. Because of her touring schedule, Wilson says, she didn't enroll in high school, but at the Adult Learning Center of Wilson County, Tenn. It turned out, her biggest weakness was math. The first time she walked in, Wilson remembers, brought back her first-day-of-kindergarten jitters. Studying on the road proved difficult. She told CBS News, "I pulled the book out 500 times and tried, and opened it, and I read the first chapter of three different books over and over again. I tell people all the time, my quiet, alone, peaceful moments are very few and far between. ... I think a lot of women get that way -- women who are busy, who work for a living and have children and are doing a lot, and have a lot of things going on, you tend to put yourself last." She adds that she doesn't think she would have been a country music singer if she'd stayed in school: "What I mean to say is, I think I would have never followed the path that I followed. I may have been in the music business, but I don't think I would have been an artist. I don't think I'd have been pushy enough. I kind of had to get out there and start fighting and clawing my way through the world, and that started really early and I think that's a lot of what it took for me to finally get that record deal."